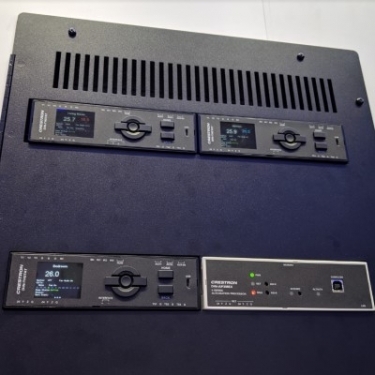 Crestron DIN-THSTAT, working in conjunction with the company's temperature and humidity sensors, installs out of the way in a compatible cabinet for a cleaner climate-control solution. Integrators typically do a nice job creating design-friendly climate controls – shunning multiple ugly thermostats in favor of discrete temperature and humidity sensors in the living areas. The thermostats that do all the work typically are mounted in a closet somewhere, taking up precious wall space and generally looking pretty amateurish. 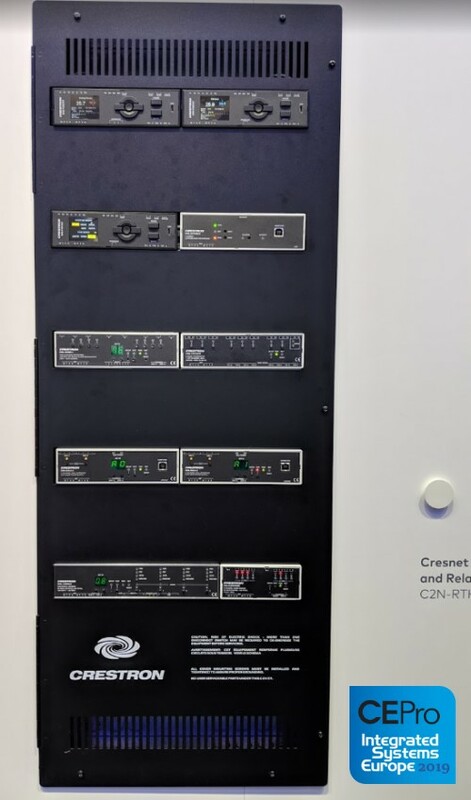 At ISE 2019, Crestron launched a system of DIN-Rail climate controls for a more efficient and sleek-looking install at the head-end. The new DIN-THSTAT mounts on a DIN rail, which supplies power to the modules. A pair of Cresnet ports is provided on the DIN-THSTAT to allow easy daisy-chaining of several stats or other Crestron DIN rail devices such as the DIN-AP3 3-Series automation processor. The thermostats (shipping now) pair with new Professional Installation Cabinets (shipping soon) that hide the electronics but expose the controls, including a new “more modern, color-LCD window,” Crestron VP residential tells CE Pro. 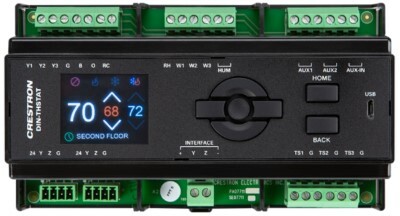 Rockleigh, NJ – March 8, 2019 – Crestron, a global leader in smart home technology, announced it is now shipping its new DIN-THSTAT DIN Rail Mountable thermostat. Additionally, new Professional Installation Cabinets that perfectly pair with the DIN-THSTAT will be shipping soon. Together, the new thermostat and cabinets enable system integrators to deliver clean professional, climate control installations. Used with Crestron CHV-RTS, CHV-RTHS, or CHV-RSS temperature sensors, the DIN-THSTAT provides 3-stage heating and cooling, support for three independent remote sensor inputs, a full color LCD display for easy setup and diagnostics, and flexible Cresnet® communications. The DIN-THSTAT can be installed in an equipment cabinet or on a wall. The cabinet can be flush or surface mounted. It’s supported in Crestron Pyng®, D3 Pro®, and SIMPL software, making it easy to retrieve and upload full configurations. A Crestron control system connection allows temperature adjustments from virtually anywhere, using a Crestron touch screen, handheld remote, or mobile app. The Professional Installation Cabinets will be available in three sizes and can contain up to 10 thermostats. Controls are exposed for easy access. The provided service rail can be used for power supplies, Ethernet to Cresnet® connectivity bridges, Cresnet wiring, and more.